Working at Solution BI is choosing an engaging career. 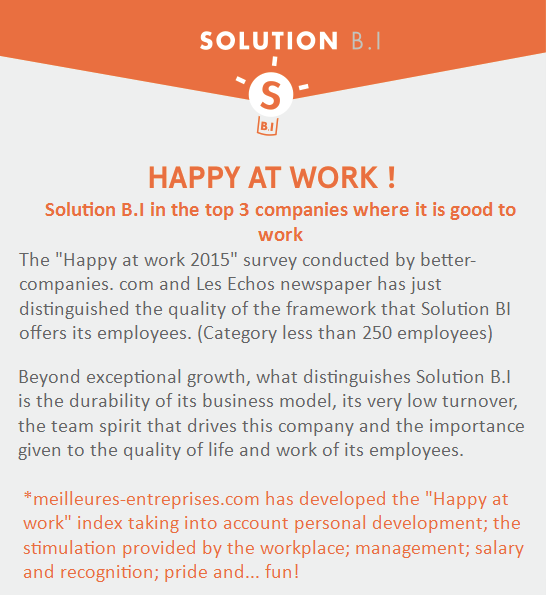 Solution B.I is a success story: a team that bet on its collaborators, proud to balance quality of life and enthusiasm at work, where it is a great place to build one’s career. With 50% of its managers coming from internal promotion, Solution B.I offers personalized support and follow-up thanks to its proximity to the executives and managers. As a company with a 2015 “Happy at work” ranking, Solution BI organizes annual international seminars, quarterly “BI events“, and fervently supports its in-house sports teams. Whether you are still a student or a senior consultant, at Solution B.I you will always find your place. Regardless of your profile, we are happy to welcome all types of skills: don’t hesitate to contact us, we always take the time to receive you.